But before you start figuring out exactly how you’re going to create more success in your life, I want to take a bit of a step back. There are tons of resources out there and different ways and recipes for how to create success in your life. But if you don’t know what success really means for YOU specifically, you might be heading in the wrong direction. 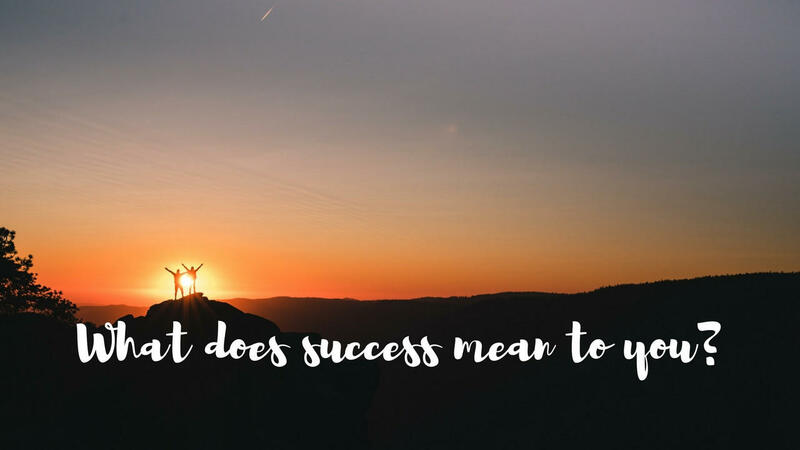 It’s really important to define exactly what success means for you. And, it’s different for everyone! Success for me looks different than what success looks like for you, and it’s all based on the things that we’ve got going on in our lives and where we want to go. So, it’s really important to define that stuff first. Here are a few questions you can ask yourself to help you figure out YOUR DEFINITION OF SUCCESS. Because once you’ve figured that out, you’ll be much better able to go after what you really want and create a life that you really love. Let’s jump into this, I’ll show you 4 questions to ask yourself to help you define what success means for you. 1. WHAT ARE MY VALUES? This is so important and it’s a perfect place to start when you’re looking creating to create more success for yourself. You have to know what your values are. And, they can evolve and change over time - they most likely will! So, it’s great to do this regularly so that you can keep up with what your values are as you move forward. The reason this is so important is because if you’re not clear on what your values are, it’s easy to find yourself living out of alignment with your values. And when you’re not aligned with your true values, you feel like things are “off”. You feel stressed, and things feel hard. Life is so much better when you’re clear on your values because you can design your life in a way that’s aligned with that, and feels really good for you. When I figured out my personal values, it changed everything for me and I started to realize why I had felt so “off” before in other situations in my life. It was because I wasn’t living in alignment with my values. That’s why defining your values is a perfect place to start! We all have an idea of this but we rarely sit down and list out all the things that we really love to do. The reason this is an important question is because a lot of us end up chasing success, or an idea of success, or even someone else's idea of success, and we think we have to do certain things to be successful. We might not necessarily like the things that we have to do to achieve what we think is success. That’s why we hear about so many people who are super successful but they’re miserable. We hear stories like that all the time. You need to love what you do so that you want to do it to create success for yourself. 3. WHAT KIND OF LIFE DO I WANT? It’s a pretty simple question but most of us don’t really take the time to define it. So, figure it out! Don’t be scared to dream big and use your imagination. Think about the question and then write about what kind of life you really want. This will help you to create that kind of life. If we don’t define exactly what we’re after, it’s hard to create that in our lives. So, figure out what you’re actually trying to achieve. 4. WHAT ARE MY GOALS? This is the fourth question we’re asking, but it’s the one most people begin with. You can see how having the foundation of the three other questions: knowing what your values are, what you love to do, and what kind of life you’re trying to create, is going to help you to create goals that are going to actually take you in the right direction. This way you can get to where you want to be in a way that’s going to feel good for you. There are a couple of things I want to point out to you to help you see how this all works together. Let's look at this visually. You’ll notice that questions 1 and 2 are INTERNAL. They’re more about what’s going on inside. What are your values, and what do you love to do? This is about you. 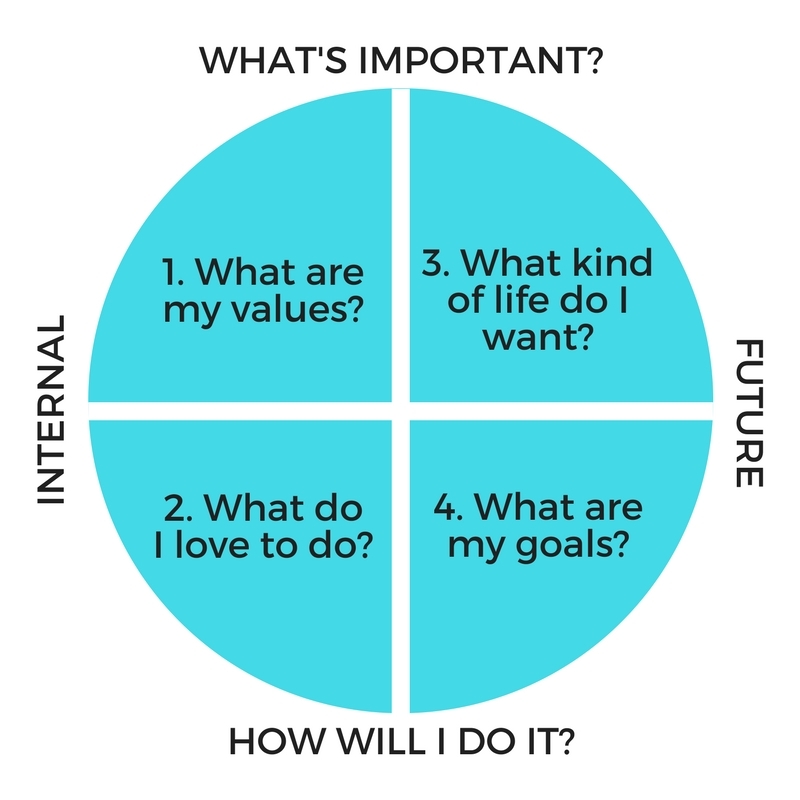 Questions 3 and 4 - what kind of life do you want, and what are your goals - those are FUTURE-oriented questions. They’re about the kind of life you’re trying to create. It’s important to know that you need a balance of the two. You need to know what ‘s going in INTERNALLY so that you can make better plans for the FUTURE. Questions 1 and 3 are about WHAT’S IMPORTANT to you. What are your values and what kind of life do you want? Questions 2 and 4 are about HOW YOU WILL DO IT. What do you love to do and what are your goals? That’s how you’re actually going to get there and create what’s important to you. This all works and fits together, and you can’t really have one without the other. I’m challenging you to do this - answer these 4 questions, even if you’ve done work like this before. Like I said, this stuff evolves over time. We change, our vision and our values change, what we love to do changes and our goals change! Stay really connected to your goals and your vision for your life so that you can create the kind of success that really matters to you - on your own terms. If you liked this and found it helpful, I would love it if you could share this with your friends, and help them create more success in their lives too!